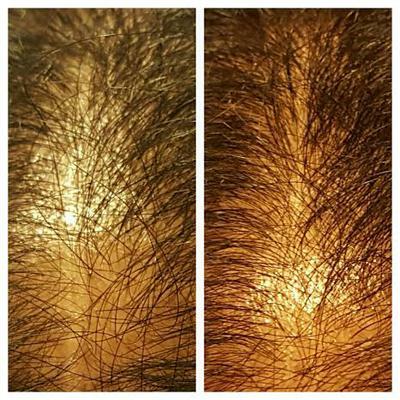 Lara's Courageous Hair Regrowth Story After 25 Years of Hair Loss! Congratulations Video for Lara! Watch Below. It has been a long one year. The diet has been easy for me, the waiting on the other hand, has not! I stumbled on your site after trying scores of other treatments and finding that absolutely nothing worked for me. I have had diffuse hair loss since the age of fifteen and this has been an ongoing process for 25 years! 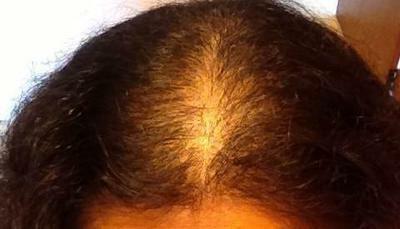 Within the first month of this diet, I started seeing little hair in my middle part, where there was nothing before. I was ecstatic! Three months down the line, I was still sticking strictly to the diet, but started shedding like crazy. My pictures from that time show even less hair than I started with. I was devastated, but you told me to hang in there. After reading other submissions on this site, I realized that this shedding could perhaps be a normal occurrence in the whole process of regrowing hair. At this point acupuncture helped a lot. After a month or two of shedding, I stabilized. However, through this entire period the regrowth continued but I guess the tiny new hair was too delicate to provide any real visual reassurance. I rapidly came back to how my hair was earlier and then started improving further. Now that my hair is slowly but surely growing back, I’m sometimes impatient because the whole process is so slow. However, I realize that if I had not started this diet, forget reversing hair loss, I would have just got worse and that is such a scary thought! As things stand, I guess I’m a walking miracle because every single doctor has told me that there is no stopping and no curing my kind of hair loss. So Sheree, my miracle maker, thank you from the bottom of my heart! Nat and Brian, you were my inspirations! I’ll end here as this is sounding increasingly like an acceptance speech for an award! 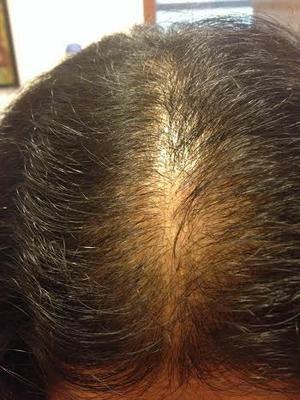 Comments for Lara's Courageous Hair Regrowth Story After 25 Years of Hair Loss! I just wanted to say congrats for even attempting this diet as it is a very slow and difficult process. Its always good to see other people's stories and their transformation both physically and mentally. I always love to hear them. I would also like to recommend another thing you can do together with the diet to help grow your hair faster. Try blending garlic + red onion + pepper (hotter the better) + apple cider vinegar + ginger and apply this mixture to your bald area for an hour or so. Then wash it out however you normally do. This is another natural method that i've seen others use for hair loss. There is a tutorial on youtube of it just search howconnie (thats her channel). This is something i've been doing the past month and my hair has grown 5%-10% back already. Together with this diet it works wonders. I've been astounded of how Its sped up my hair growth and can't say enough good about what its done for my hair loss. Give it a go if you don't believe me, you'll be amazed! I wish you continued success on reversing your hair loss. Keep on track and keep on fighting. You're going to be fine. That's awesome to hear of such success, and very encouraging! Can you tell us a little bit about your diet? Did you notice the vellus hairs being replaced by terminal hairs? Also, about the doctor thing, that's totally true, the standard response is "yeah whatever use Minoxidil, no cure", and it gets frustrating REALLY fast, I mean, they don't ask about diet or anything else at all. I heard someone say that when you go to the vet, the first thing they ask you is "what are you feeding your dog", but doctors don't? Looking forward to reading the rest of your progress, it's very inspiring! Thanks guys! this is such a big deal to me, just to know that there is hope and I'm on the right track! Hi Brian! Your pics provided me with so much inspiration. Though I feel your hair regrowth shows much more than mine, everything you spoke about, the shedding, the time taken to see improvement, how the improvement shows, exactly mirrored my own experience. Since I have undergone hair loss for way longer than you have, I am confident that I too will see results as great as yours, if I continue to stick to the diet.Thanks for sharing your progress and supporting people like me. 2 eggs scrambled with spinach, onion, tomatoes and occasionally mushrooms broccoli and cheese, flax seeds, 2 cups of green tea and a bowl of cut fruit. I used none of my cheat days right in the beginning. I do use them now and then of late. If I go out I order a fish and salad. to the movies I carry banana bread or peanuts or dark chocolate. I noticed fine little hair right in the beginnning, but that's all I noticed for a long time. At the ten month mark, I started to feel that they were getting longer and thicker and there is more fine little hair growing around that regrowth. All the best with your regrowth! I can't tell you how excited I am for you. You deserve these results. When things got tough, you hung on. You never quit. As I was watching you go through the diet, I could sense your determination. We both knew it would work, it was just a matter of time. You are fearless, relentless, powerful and beautiful. Your story has given us so much, because you showed us how extended hair loss is reversed. This is priceless information that we wouldn't have had otherwise. Your take no prisoners dogged persistence has paid off. What a loving tribute you are to hair loss survivors all around the world. Thank you, because you have paved the way for others. You've set the stage for thousands of women and men to recover. I am hysterically happy and proud of you. I am deeply moved by your recovery and your story. We'll be looking for more updates and pictures. Thankyou, my Sheree! Your sheer confidence has got me this far. You are such a path breaker. I can't believe no one else figured out this reason for hairloss. Or maybe they did but don't speak about it for commercial reasons. I have always said you have a big heart, and it is so apparent in the way you share your knowledge and support. You are my lifesaver literally. Just imagine, if it wasn't for this site, I would have believed all the doctors and would have eventually lost all of my hair! Brian, thanks for sharing the recipe for the hairmask. How often do you use it, to get the results you've seen? It depends on my schedule, however for the past month, I've been using the hair mask at least once a day and gotten amazing results. I usually apply it just before i eat and leave it in for an hour. I don't know if having the hair mask in your scalp and eating together has double the effect but its been working effective for me. I think you should use it everyday or twice a day (once in the morning and once at night) if you can for the first little while until you feel comfortable that you don't need to do it so much anymore. Or whatever works around your schedule. Also I forgot, when you're adding the pepper in the mixture, the hotter is the better for you but cut a little piece and taste it to see if you handle the pepper. If you have a sensitive scalp, use a pepper with less heat. Or if you can't handle the really hot pepper, use a different pepper in your mixture. I believe the heat from the pepper is similar to giving yourself a scalp massage and getting the blood circulating to your head. Thats why the hotter the pepper you use the better. Its the better scalp massage. The only problem with the hair mask is the onion pieces that get stuck in your hair. However, i just use a comb and comb them out or use my hand to get out the pieces. For me, its not that big a deal. For people that have longer hair it might be a bigger problem. This by far is the most effective method for dealing with hair loss that i've come across of eating healthy + using the hair mask daily. I think it'll work for 100% of the people that try it. When I do my 2 year update results, in a couple months, I'll be showing everyone the significant growth in volume. The improvement is very exciting. Looking forward to your updates, good luck! It is great that you've a 5-10% regrowth of hair after the onion mask. Your one year update shows a lot of regrowth already so I can't wait to see your pics now! The mask would also require equal amount of dedication as the diet, since you need to use it everyday and let it sit for an hour each time. I really want to try it out but am still trying to work out a convenient time! Hope to see your pics soon! How long have you been on the diet? 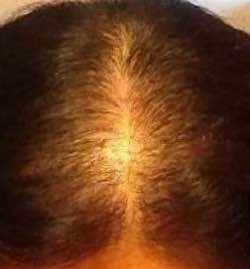 Have you seen any regrowth and have you posted any pics? Well, technically I've been "on the diet" for about 4-5 months, but a more accurate time would be 2 months, because when I first started, I was eating way too much beans, so I had to constantly tweak it, and I think I'm pretty happy with it now (I need to eat more vegetables though). I've posted pics in my thread on the forums yes, but as for regrowth I can't say that I've seen any yet, but it's understandable since it hasn't been long since I've started the diet, and my diet before the 5 month mark was pretty bad, loaded with bread (I was a victim of the "healthy whole grain bread" thing), and honey bunches of oats cereal (not the worst cereal you can buy, but certainly not good). I've added detumescence therapy to my regimen a few days ago as well, basically it's a thorough scalp massage where I put lots of pressure on my scalp and knead it like you knead bread (being careful to move the SCALP, not the fingers because this can break/damage your hairs), the rationale being you break up scar tissue/fibrosis or something like that and reduce the dome shape of the head, but that's oversimplified I can't explain it too good, lol. Also I'm going to start taking Taurine supplements, perhaps 3 grams a day, this is good for countering fibrosis throughout the body, and also fibrosis of the hair follicles. In addition to all that I have started this "massage" where you grab a handful of hair close to the scalp and gently pull it until it feels sore, but not to the point where it actually hurts. It feels pretty good surprisingly, like when you lift the hair/scalp up some serious tension gets released! Anyway, looking forward to your updates, it's very encouraging to hear of regrowth, it's proof that hair follicles never "die"! It's been two days since I started the onion mask treatment. I know it's too early to see any results yet but my hair feels like it has more volume somehow. I hope this works for me too. Waiting to see your pics since that would be a great source of inspiration to all of us. I checked your comment over on my page and decided to write you over here. Congrats on your success so far! Yea, I got immediate success myself with the onion mask and was surprised by it all. Its been a great breakthrough for me and something I wanted to share with other people. I'm glad its working for you. I've been doing it for about 3 months now and my hair has completely changed and have so much new hairs. I can't wait for the end of the next month to do my 2 year update and show everyone how much new regrowth I've gotten from doing it for such a short amount of time. I love inspiring people and hope others try it out as well. Its really the most effective natural method against hair loss. Eating healthy + onion mask together. Congrads! Lara, your hair loss looks similar to mine. I am also on this diet. When did you start to see growth? I started the hair loss diet two months ago and Sheree recommended I may try talking to you about your experience. I am 32 and have had hair loss since the age of 14 which got significantly worse three years ago. My official diagnosis is chronic tellogen effluvium but there are signs of AGA as well. My problem is that even though I tend to think I see a little more tiny regrowth at my front hairline since I started, I am still shedding huge amounts of hair everyday. I know you had shedding on the diet, could you please tell me how did you cope with it. I really believe in the diet and am rigorously sticking to it but I am scared I may be the odd one who (I dont even want to say that ...). I will look forward to hearing from you. My hair loss started when I was about to turn 26, a few days before. It was a huge chunk coming out. I was scared, to be honest, and I did not want to face people. I had the best hair, according to everyone, and I never thought it would happen to me and it did. I found out in the process I had type 2 diabetes so I have to first bring my sugar under control and then my hair will grow back. I actually showed my doctor about the diet and he said that it is awesome, just to be careful that I don't under eat. I really need a support system in this. When I saw your pictures of your hair. I knew right away that my hair was similar in many ways like yours. I would love to show it to you and maybe we can keep a check on each other every week so I know that I have someone I can talk to. Let me know if you want to. I just want you to know that I am in your shoes as well so reach out to me whenever you need someone to talk to. Ask Sheree for my email so she can send it to you privately. We can talk to share the journey together. I need a supporting hand in this. Sorry for this late reply. I only just saw your message. I would love to provide whatever support I can. By all means please do share my mail id with Tereza. Oh sorry, I think it was Teresa not Tereza who asked for my mail id, but I have no problem sharing it with either of them, Sheree. I know how devastating this issue is and would love to be able to provide support if I can. I'm going to get ahold of Teresa ASAP. I'm pretty sure I still have her email, and then I'll give it to you. Thank you so much for being so sweet and helping her out! Teresa my hair loss started at at the age of 15 so around the time of puberty. It got really bad during my two pregnancies. The structure of the hair also changed from super thick and wavy to thin dry and brittle. I definitely know the main underlying issue was my poor diet.And that is what I set right first by following Sheree's guidelines. However with hair loss of such a long duration, I think you need a little more help so I started using the onion mask recommended by Brian. What I recently found out was that my ferritin and vitamin D levels were really low. My ferritin was within the normal range which starts at 20 but was at the lower end of this range. It was 22 and my doctor at first refused to give me any supplements. She finally gave in and prescribed a ferrous ascorbate supplement. I am also on a vitamin d supplement powder. Within around 3 weeks I realized the dark circles around my eyes had reduced, PMS symptoms disappeared and my need for sleep decreased. Best of all, my hair shedding dramatically reduced! If your body has been deprived of nutrients for so long you need to sometimes normalize your levels first so that the diet can really help you. Also get your thyroid and testosterone levels checked. It takes time and perseverance, but after one and a half years I'm seeing slow rests but results nevertheless! Don't worry you WILL grow back your hair. Thank you for your response Lara! Thank you so much for your response. I am having the most difficulty with not having my hair like it used to be 3 years ago.My hair is very very thin as it just covers my head. I got all my test done. I even went to 2 dermatologist and 1 gyno who said my levels were slightly elevated in DHEAs and Testosterone but barely high enough to cause hair loss according to my gyno. I was also diagnosed with type 2 diabetes which according to my doctor, it would not cause hair loss. That's him saying that. I do believe high sugar level caused this to my hair, but it so difficult for me to function. I needed a support system so that I can talk to someone for days that is harder for me to cope. Sheree has been great and I am so thankful that I have found this site. It has helped me get my diet back to healthy. As the past 3 years, my diet has been sugary drinks and fast food everyday and everytime. I am hoping that I can share my crazy adventure to you that will lead me to having all my crazy long healthy gorgeous hair back. Just take a look at the picture of my part. The picture on the right has more hair than the one on the left. Amazingly the first picture was taken on the 25th of June and the second one on the 30th of June! Just 5 days apart! I have been using the onion hair mask recommended by Brian for the past 13 days and these are the results. Brian is right, the diet along with this mask work wonders! I have attached a pic which shows my hair from July last year and September this year. I'm so excited because in the smooth shiny spot (July pic) you can now actually see hair growing (Sept pic)! I think the hair is growing back first from the place it started falling out first. Each individual hair also seems thicker! I'm so, so very happy!!!! areas from where it fell out first. come there and give you a great big hug!!!! Thank you for continuing to update us on your progress. I am so glad you are continuing to see great results!! 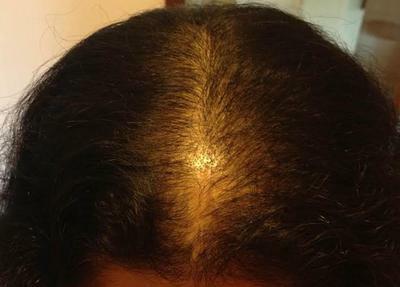 I am also a woman from India and experiencing hair loss like yourself. I have been on and off this diet (my main issue is cutting out wheat - cutting out roti is very hard for me) for quite a long time. I admire your persistence and discipline! You are a source of encouragement for me and I love hearing about your progress!! 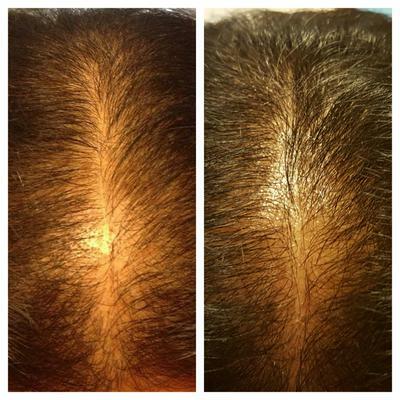 Learn the Science of Hair Regrowth!